A local man has spoken of how his stepdaughter has been denied her ‘basic human rights’, following an accident which left her paralysed from the breast bone down. Paul Phillips described the ‘traumatic’ experience his family has faced since his stepdaughter Anastassiya was involved in a horrific car accident in March. Anastassiya, now 17, was just 16-years-old when she was travelling to give her mother a present early on Mother’s Day, on Sunday March 15, 2015. 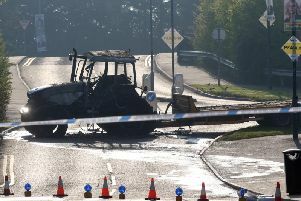 The teenager was travelling to Lisburn when the single-vehicle accident happened on the Magheraknock Road, Ballynahinch. The vehicle left the road, entered a field and rolled onto its roof. Anastassiya was left in a critical condition, suffering multiple broken vertebrae, her neck broken in three places, 12 ribs broken, which pierced her lungs and bleeding on the brain. She was treated at the Royal Victoria Hospital, before being moved to Musgrave for rehabilitation. Anastassiya remained in hospital until July 1, however, Paul says that was when problems for Anastassiya and the family began. “Anastassiya was discharged without a care plan, as such,” Paul claimed. “We had none of the equipment in place; no bed, a borrowed wheelchair and no standing frame, which helps prevent muscle wastage in the legs. “She left hospital with a borrowed wheelchair, which we had to sign a loan agreement for. “We have only recently received her wheelchair and when that arrived, it didn’t have the cushion, which is needed for preventing sores. The family were left shocked when they asked at the hospital how they would wash and shower Anastassiya until an adaptation or extension was carried out on their home in Killaney Avenue, Old Warren. The local family, whose home is owned by Helm Housing, eventually had a temporary shower put into a downstairs toilet in their home around eight weeks later. However, it will be at least another seven months before their home is fully adapted for Anastassiya. Whilst the family were offered a bungalow, it was a much smaller property, which would not adequately fit the family, which includes Anastssiya’s five year old brother. “Anastassiya has less than one metre between the sofa and her wheelchair. There are personal issues involved. She is doubly incontinent and has to self catheter, with her mother helping her. She has to be lying down for this, so has to be toileted in the living room. “For showering she has to be transferred to a shower chair and then wheeled in through naked and dried and dressed. “Myself and her brother have to leave the room and go upstairs, she is still a teenage girl. Anastassiya was studying Business Administration at Belfast Met, and hopes to return to study, however, will likely have to complete her study at home, due to her catheter. “There is a high level of embarrassment, if something should happen. She is just a teenager,” Paul added. Despite having finally gotten a hospital bed, Paul said he is ‘bewildered at the lack of concern for her safety,’ after the bed has a release mechanism, which Anastassiya can’t reach. “The first bed we got was an antique bed with wooden boards on either end. Anastassiya has leg spasms and she developed infections in her toes by hitting them off the base. “Her new bed has a release mechanism which is on the floor. It is a safety issue. The family are hopeful that Anastassiya may one day walk again and have arranged two fundraising events, which they hope will raise funds and awareness. They hope to take Anastassiya to the USA for pioneering Stem Cell treatment, and have set a target of raising £50,000 to get her there. “Stem Cell treatment has a very high success rate,” said Paul. “It involves a course of injections of cells into the spinal nervous system. There is a 70% plus success rate. “Anastassiya’s spinal cord wasn’t broken, it was traumatised; the spinal cord managed to stay intact. “The worst case is further movement and more ability, the best case is she can walk again. “We won’t accept that Anastassiya can’t or won’t walk again. We will do everything we can to give her the best chance. We have to get the balance right between support and care to get her on her feet. “It’s very much in God’s hand how and when, but we believe she can walk again, and we will do whatever we can to get to this point on her journey, it will be a long journey and a long recovery, but we will be there with her. A number of fundraising events have been organised for Anastassiya. Meanwhile, a bowling fundraiser will take place at Lisburn Bowl on November 5 from 7pm-8.30pm. Eighteen companies will take a lane at the bowling alley, costing £100 for a team of six participating. Music and refreshments will be provided, whilst a raflle will be held.